Smart phones, tablets and laptops have made computing more mobile. But, are your workplace computers completely mobile, yet? Isn't it time for you to upgrade to ergonomic sit stand workstation carts? Can you view your computer monitors from every inch of your floor? Would you like to have that functionality? Nowadays, real-time responses are becoming the norm. It might be a real-time response to an assembly line glitch or an unexpected problem associated with surgery. When you have a sit stand monitor arm, you can see what is going on anywhere and react in real-time. This can improve your product quality and quantity. Instead of shutting down your assembly line, you can get a technician to the problem point and fix it in no time flat. A medical display monitor could be the difference between life and death during surgery. Responding in real-time can increase your productivity. You can send essential information to the right parties and they can use this actionable data to make real-time modifications on-the-fly. Dollies, creepers and rolling chairs have become standard in a variety of workplaces. Our Cotytech ergonomic products can make your workplace more adaptable. Your workers can use our Cotytech sit stand monitor arm to adjust heights. Our sit stand workstation platform can hold a CPU, monitor, printer, keyboard and mouse. The height can be adjusted from 33.5 to 51 inches (85 to 129.5 centimeters). Our mobile workstations with wheels and cable manager are also narrow, fitting nicely through doors. If you have one employee at a trade show, give him the adaptability to multi-task. The other feature that our sit stand monitor mount can provide is comfort. When a worker is on an eight-hour shift, he might start to become tired, if your equipment is immobile. A modern sit stand monitor arm allows you to multitask. 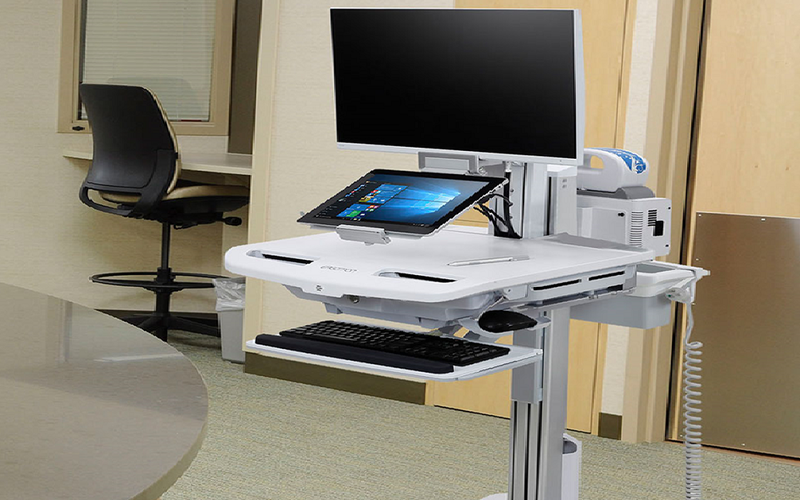 A Cotytech workstation with wheels can be moved from room to room to take the vitals of patients. All of the vital information can be stored on one single mobile workstation. When the next nurse arrives, she can simply use the same workstation on wheels. Shift to shift hand off can be more seamless. Increase productivity, adaptability and comfort with Cotytech ergonomic mounts. While these products hold one monitor, we also have a separate sit stand dual monitor arm for desks. Make your computer displays mobile with one of our Cotytech sit stand monitor mount carts.